CoQ10 — there’s nobody nowhere who won’t benefit somehow. Coenzyme Q10 (CoQ10) is a component of the molecular apparatus responsible for energy production in cells. Without it, cells would die within minutes. Because CoQ10 plays so fundamental a role in biology, it is good to have plenty of it available. 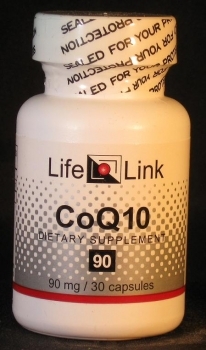 A surplus of CoQ10 is beneficial for many conditions, including aging. Low CoQ10 levels cause muscle weakness and atrophy, heart and liver disease, and cancer, among other things. Consequently, CoQ10 is widely prescribed in Europe and Japan as an effective treatment for these conditions. Low CoQ10 levels are linked to tumors and cancers, and supplementation can deliver remissions in otherwise untreatable cases, including lung, breast, and prostate cancer. When combined with traditional chemotherapy and radiation, CoQ10 amplifies treatment results while protecting the heart and liver from damage. It minimizes or eliminates many side effects including nausea, vomiting, and hair-loss. CoQ10 levels are severely depleted by many medications, including beta-blockers and statins. Advicor, Crestor, Lescol, Lipitor, Mevacor, Pravachol, Zocor, and other statins inhibit CoQ10 production to the degree that patients can experience muscle pain and wasting, heart disease, liver damage, kidney failure, fatigue, and cancer. Everyone should be taking CoQ10 supplements, because everyone is at risk for heart disease, liver disorders, and cancer, whether or not they take statins. There is no downside to CoQ10 supplementation — it has no side-effects. Coenzyme Q10 (CoQ10) benefits many conditions and reduces aging (see our CoQ10: Anti-Aging and Pro-Health and Idebenone: A Better Coenzyme Q10 flyers); it is crucial, however, for those who have, or are at risk for, heart disease and cancer, and mandatory for anyone taking statins for cholesterol. (The FDA is considering mandatory warnings alerting those taking statins that CoQ10 supplementation is required.) Low CoQ10 levels cause and aggravate muscle weakness and atrophy, heart and liver disease, and cancer, among other conditions. “Cardiovascular disease may be very significantly caused by a deficiency of CoQ10.” So said Dr. Karl Folkers, famed for, among numerous accomplishments, discovering vitamin B-12’s structure, synthesizing Vitamin B-6, and discovering CoQ10’s structure and synthesis. His statement isn’t surprising given the heart’s ferocious appetite for energy. CoQ10 is widely prescribed in Europe and Japan as an effective — and side-effect free — treatment for irregular heartbeat, angina, congestive heart failure, and cardiomyopathy. (Acetyl-L-carnitine and lipoic acid are related; our flyers have details.) Beyond its role in cardiovascular function, CoQ10 is known to prevent or stop cancer. Low CoQ10 levels are linked to tumors and cancers, and supplementation can deliver remissions in otherwise untreatable cases, including lung, breast, and prostate. When combined with traditional chemotherapy and radiation, CoQ10 amplifies treatment results while protecting the heart and liver from damage — often severe enough to require transplants — and minimizing or eliminating many side effects including nausea, vomiting, and hair-loss. CoQ10 levels are severely reduced, to the point of serious illness, by many medications, including heart-related drugs like beta-blockers and statins. CoQ10 supplementation should be required for everyone, since we are all at risk for heart disease, liver disorders, and cancer, even if we don’t take statins. Widely accepted as safe, effective, and highly beneficial, CoQ10’s other name is ubiquinone, from the Latin meaning “everywhere”; why aren’t you taking it?